Two beavers are standing looking at the Hoover Dam and one says to the other, “I didn’t build it, but it was my design”. Cue laughter. Now picture the same gag line under a cartoon of two artists looking at an enormous public sculpture. The gag still works, but the laughter’s forced. Because while a beaver has an innate grasp of the fundamentals of dam building, your average contemporary artist doodling a landmark sculpture on the back of an envelope could fit his knowledge of structural engineering on the other side. This might bother a beaver, but we’re not fussed. In a world of ever narrowing specialisations, we habitually depend on the skills of others. Renaissance artists working in the public sphere were expected to master the principles of construction: Michelangelo and Raphael were architects, Leonardo was an engineer. But in this age of alpha males rather than Renaissance men, our public artists only seem able to function with specialist support from Ove Arup. For a decade, the global firm of structural engineers which cut its teeth on the Sydney Opera House has kindly put itself at the disposal of contemporary sculptors in distress. A regional development agency, say, has commissioned a landmark sculpture you have absolutely no idea how to construct: simply summon the Arup genie from the bottle and all your structural worries will disappear. With added Arup, you can aim higher and think bigger. The firm can turn any 3-D dream into reality, and if you split the money with them you can take all the credit. They won’t mind, it’s just a job to them. When it’s over they’ll go back to doing something useful with their time, like building bridges. Search the small print of the biggest public art commissions of the past decade, and the magic name of Arup will appear. 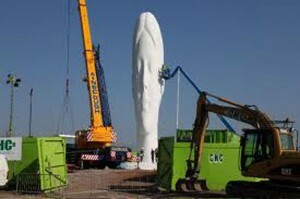 If it’s a massive sculpture lifting the profile of a blighted skyline, Arup will be behind it holding it up. Conveniently, the firm seems to have an office in every northern town. 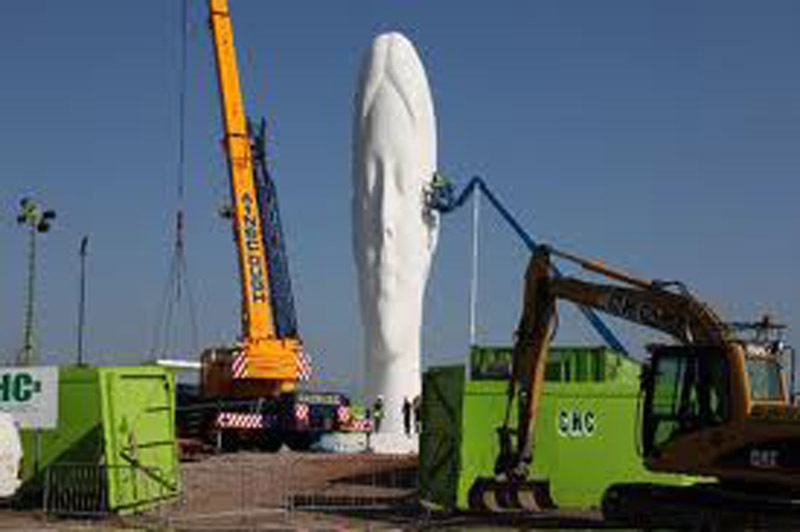 When St Helens Council commissioned Jaume Plensa’s The Dream – the 20m concrete head now sprouting like a giant mushroom on the site of the former Sutton Manor Colliery – Arup’s Liverpool office made the dream come true. Their assistance goes beyond structural design. According to the Arup website, they also took charge of the “planning, tendering and commissioning processes”, plus the “specialist ecology, lighting engineering and 3-D imagery, all required for the planning application submission”. Don’t stare in despair at your landmark doodle; just hand Arup the envelope and they’ll work out the “complex geometries” and come up with a professional “assessment of overall stability and ‘buildability’.” Arup is the Jim’ll Fix It of the landmark sculpture business, a one-stop-shop for local enterprise partnerships wishing to lay the ghosts of the industrial past by commissioning monstrous beacons of false hope for the future. It was Arup that calculated the wind-resistance of the Angel of the North’s 54m wingspan and stopped the 20m Gormley falling on its face, winning such gratitude from the artist that he has retained their services ever since. Arup’s Advanced Geometry Unit was the eminence grise behind Gormley’s Quantum Cloud at Greenwich and the brains behind the collapse mechanism built into his latest batch of iron men in the Waters of Leith, designed to make them go down like ninepins in the event of flooding (a sight I’d pay good money to see). If Thomas ‘Spillikins’ Heatherwick had had the humility to call on their superior expertise The B of the Bang might not have blown up in his face, but he was foolish enough to imagine he could go it alone. Anish Kapoor has no such illusions. It was Arup that stopped his Marsyas idea from going down like a PVC balloon in 2002. “If the calculations had been 1% out,” their engineer admitted, “it would have been sitting on the ground” – along, presumably, with the artist’s career. After that, Kapoor was Arup’s for life. He hasn’t put pen to back of envelope since without the firm’s deputy chairman and AGU founder Cecil Balmond in attendance to do the workings out in the margin. They share an interest, apparently, in “interrogating form”. It was Balmond who ensured that Kapoor’s Temenos, the £2.7m 120m windsock launched in Middlesbrough last year, didn’t take off, and it is Balmond who will guarantee that the Arcelor-Mittal Orbit stays up for the duration of the 2012 Olympics. Now a celebrity in his own right, Balmond left Arup last October to found his own company and devote more of his time to art. It can’t be long before the engineers remove the artists from the equation altogether. But they’ll have to do better than the July 7th Memorial, a soulless experiment in art-free design by architects Carmody Groarke and, yes, engineers Arup that surely ranks as the world’s least memorable monument, while serving as a stark reminder of why monuments need sculptors. The question is, do monuments need engineers? The answer is, only when they are unjustifiably big. There are good reasons for making enormous dams, but there are almost never good reasons for making enormous sculptures. In fact, the reasons are almost invariably bad: jingoistic, militaristic, imperialistic, narcissistic or just plain hubristic. Temenos was to be the first of a £15m series of five giant Kapoors destined to ‘rejuvenate’ the Durham towns, with four more planned for Stockton, Hartlepool, Darlington and Redcar & Cleveland. Together, boasted the scheme’s publicity, the ‘Tees Valley Giants’ would “form the most significant public art project anywhere in the world”. With even greater hubris, the director of Middlesbrough Institute of Modern Art Kate Brinsley proclaimed that Temenos would “call on the traditional twin skills of the region: precision engineering and heavy industry”. She neglected to say how many workers with those skills it would take off the dole queue in what has just been named the most economically vulnerable city in Britain. Now the North East’s regional development agency is being abolished and Tees Valley Unlimited, the local enterprise partnership behind the scheme, has had its budget slashed and lost its tourism arm. It looks as if four of the giants may never awaken, and cultural tour operators will have to strike Teesside off their itineraries. Interrogating form is a game best played on a small scale, a scale at which the sculptor can work unaided. The RA exhibition Modern British Sculpture includes a 1937 piece by Naum Gabo titled Spheric Theme: Transparent Variation, a twisted double parabola of striated celluloid that speaks of flight more eloquently than the Angel of the North and, at its full eight inches, is more imposing. Unlike Hepworth, whose Single Form (Memorial) was scaled up to a monumental 21ft outside the United Nations Building, Gabo never hit the public sculpture jackpot (although ironically, with his engineering background, he would have had no trouble making monuments stand up). And so his sculptures remain as pure experiments in form, material and light on which no weight of meaning has to rest. They don’t have to trumpet anything, rejuvenate anything, apologise for anything. Their thinking was done in the materials of which they are made, with the result that they are entirely self-supporting.